The details, just published in the journal New Space, are certainly ambitious. But are they realistic? As someone who works on solar system exploration, and the European Space Agency’s new Mars rover in particular, I find them incredible in several ways. First of all, let’s not dismiss Musk as a Silicon Valley daydreamer. He has had tremendous success with rocket launches to space already. His paper proposes several interesting ways of trying to get to Mars and beyond – and he aims to build a “self-sustaining city” on the red planet. Musk outlining initial plans in 2016. The idea depends on getting cheaper access to space – the paper says the cost of trips to Mars must be lowered by “five million percent”. An important part of this will be reusable space technology. This is an excellent idea that Musk is already putting into practice with impressive landings of rocket stages back on Earth – undoubtedly a huge technological step. Making fuel on Mars and stations beyond it is something he also proposes, to make the costs feasible. Experiments towards this are underway, demonstrating that choosing the right propellant is key. The MOXIE experiment on the NASA 2020 rover will investigate whether we can produce oxygen from atmospheric CO2 on Mars. This may be possible. But Musk would like to make methane as well – it would be cheaper and more reusable. This is a tricky reaction which requires a lot of energy. Yet, so far, it’s all fairly doable. But the plans then get more and more incredible. Musk wants to launch enormous spaceships into orbit around Earth where they will be refuelled several times using boosters launched from the ground while waiting to head to Mars. Each will be designed to take 100 people and Musk wants to launch 1,000 such ships in the space of 40 to 100 years, enabling a million people to leave Earth. There would also be interplanetary fuel-filling stations on bodies such as Enceladus, Europa and even Saturn’s moon Titan, where there may have been, or may still be, life. 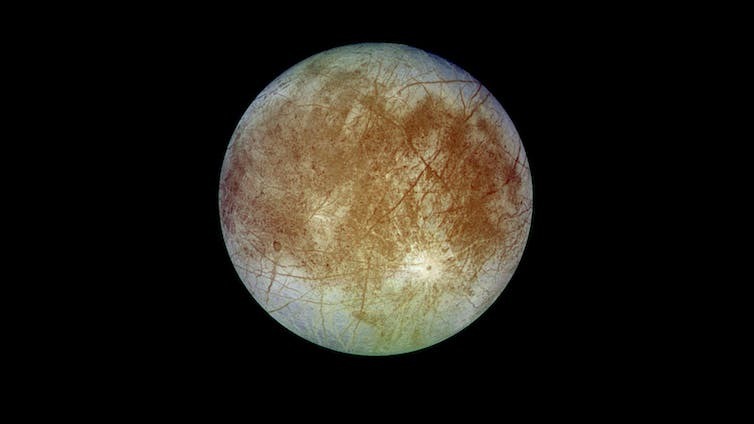 Fuel would be produced and stored on these moons. The aim of these would be to enable us to travel deeper into space to places such as the Kuiper belt and the Oort cloud. The “Red Dragon” capsule is proposed as a potential lander on such missions, using propulsion in combination with other technology rather than parachutes as most Mars missions do. Musk plans to test such a landing on Mars in 2020 with an unmanned mission. But it’s unclear whether it’s doable and the fuel requirements are huge. There are three hugely important things that Musk misses or dismisses in the paper. Missions such as the ExoMars 2020 rover – and plans to return samples to Earth – will search for signs of life on Mars. And we must await the results before potentially contaminating Mars with humans and their waste. Planetary bodies are covered by “planetary protection” rules to avoid contamination and it’s important for science that all future missions follow them. 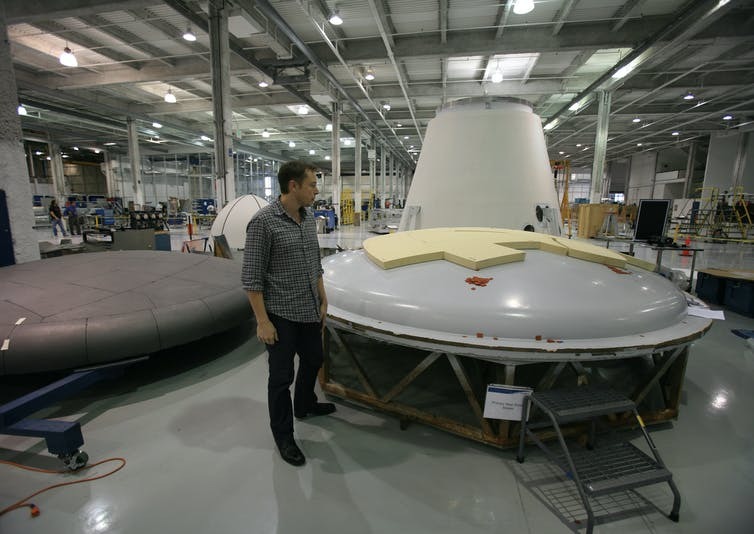 Musk inspecting a heat shield at the SpaceX factory. It is a little cold, but we can warm it up. It has a very helpful atmosphere, which, being primarily CO2 with some nitrogen and argon and a few other trace elements, means that we can grow plants on Mars just by compressing the atmosphere. In reality, the temperature on Mars drops from about 0°C during the day to nearly -120°C at night. Operating in such low temperatures is already extremely difficult for small landers and rovers. In fact, it is an issue that has been solved with heaters in the design for the 300kg ExoMars 2020 rover – but the amount of power required would likely be a show-stopper for a “self-sustaining city”. Musk doesn’t give any details for how to warm the planet up or compress the atmosphere – each of which are enormous engineering challenges. Previously, science fiction writers have suggested “terraforming” – possibly involving melting its icecaps. This is not only changing the environment forever but would also be challenging in that there is no magnetic field on Mars to help retain the new atmosphere that such manipulation would create. Mars has been losing its atmosphere gradually for 3.8 billion years – which means it would be hard to keep any such warmed-up atmosphere from escaping into space. The final major problem is that there is no mention of radiation beyond Earth’s magnetic cocoon. The journey to and life on Mars would be vulnerable to potentially fatal cosmic rays from our galaxy and from solar flares. Forecasting for solar flares is in its infancy. With current shielding technology, just a round-trip manned mission to Mars would expose the astronauts to up to four times the advised career limits for astronauts of radiation. It could also harm unmanned spacecraft. Work is underway on predicting space weather and developing better shielding. This would mitigate some of the problems – but we are not there yet. For missions further afield, there are also questions about temperature and radiation in using Europa and Enceladus as filling stations – with no proper engineering studies assessing them. These moons are bathed in the strongest radiation belts in the solar system. What’s more, I’d question whether it is helpful to see these exciting scientific targets, arguably even more likely than Mars to host current life, as “propellant depots”. The plans for going further to the Kuiper belt and Oort cloud with humans is firmly in the science fiction arena – it is simply too far and we have no infrastructure. In fact, if Musk really wants to create a new home for humans, the moon may be his best bet – it’s closer after all, which would make it much cheaper. That said, aiming high usually means we will achieve something – and Musk’s latest plans may help pave the way for later exploration.